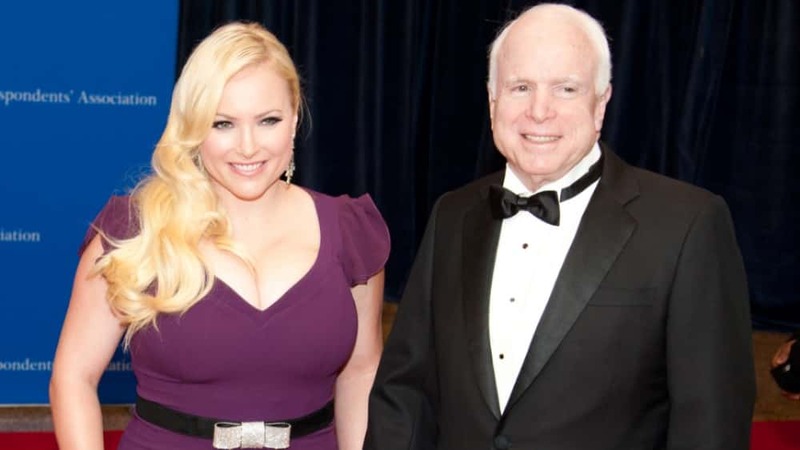 Meghan McCain will be returning as one of the co-hosts on ABC’s The View, more than a month after the death of her father, Senator John McCain. “I will be getting back on the horse ⁦@TheView⁩ Monday October 8th,” the 33-year-old tweeted on Monday, October 1. “Thank you all for your patience & understanding.” Along with her announcement, Meghan posted an editorial cartoon by The Arizona Republic’s Steve Benson, a drawing depicting her as a boxer prepping for a fight and lacing on a boxing glove emblazoned with the word “Dad.” McCain also quoted Rocky Balboa in her tweet, writing, “It’s not about how hard you hit. It’s about how hard can you get hit and keep moving forward.” Senator John McCain died on August 25, just one day after his family announced that the Senator would be discontinuing treatment for his brain cancer. He was 81. Meghan delivered her father’s eulogy at his funeral, and her cohosts on The View acknowledged her absence during the Season 22 premiere three days later. “Meghan is spending time with her family,” Whoopi Goldberg said, then spoke of Meghan’s eulogy. “It was quite an emotional farewell. Meghan was extraordinary talking about him.” Meghan has starred on The View since 2017; along with Goldberg, her costars in Season 22 are Joy Behar, Sunny Hostin and Abby Huntsman.